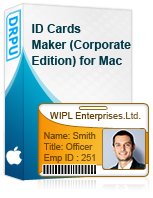 Order Online ID Card Designer Corporate Edition for Mac design multiple ID cards with different barcode value and text on Mac machine. Software provide option to capture id card user's photo using inbuilt camera in software. You can crop images as per your requirements while designing ID cards using Image Cropping Tool.